The Lake Ouachita! Vista Trail (LOViT) is a well-designed and well-built trail on 90 percent singletrack through old growth, mixed species forest. It offers riders multiple challenges and rewards as it traverses deep verdant valleys and five different mountains while crossing multiple streams and creeks. It was built as a winding trail along the southern shore of Lake Ouachita to link all the resorts and campgrounds. This section of the trail (Hickory Nut Mountain/Crystal Springs) is considered the easier climb/descent to or from Hickory Nut Mountain. This is still a very strenuous and difficult climb but not as sketchy as the west side. 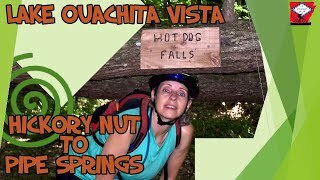 From the Hickory Nut Mountain trailhead, you can ride up the forest road to the Hickory Nut Mountain overlook which offers a spectacular vista of Lake Ouachita. This section of trail has a mixture of shorter, steep climbs/descents and flowy singletrack. I would definitely rate this section as intermediate to advanced. There's nothing super technical but some of the climbs are pretty strenuous. The climb up to Hickory Nut mountain is a little over 2 miles long and has some sections with fairly steep pitches. The Forest Road (FS 47) heading to/from Pipe Spring can be a little confusing. The trail jumps across FS 47 several times and you really have to watch for the signs and blazes as you move along. FS 47 intersects the Charlton Trail where there is a pipe sticking out of the hillside and spring water pouring out. The LOViT goes east here while the Charlton goes south. Crystal Springs is at one of the lowest elevations along the trail so you'll either descend down to it coming from the west or climb out of it from the trailhead heading west. The LOViT trail is usually best-ridden section by section, either as an out-and-back or as a point-to-point having shuttled cars ahead of time. Super pretty in the spring. No one was around. Most of the climbs are short but steep.